New You Aesthetics is a brand new, state of the art clinic in Bunbury providing the latest cosmetic treatments and evidence-based laser technology to their clients with high end care and results. 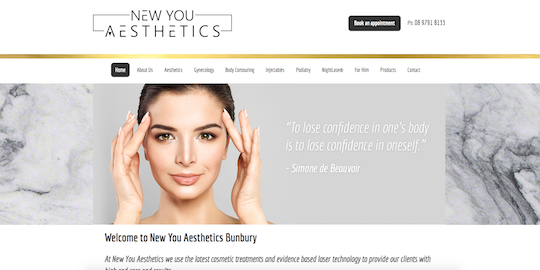 The team at Brandicoot worked closely with New You Aesthetics to produce a website that clearly outlines the treatments and technology available at the clinic. Facebook & Instagram embedded for social integration directly from the website. and a simple, easy to find contact page including a Customised Contact Form that means getting in touch with New You Aesthetics has never been easier! Visit the New You Aesthetics website today!